I've had raging insomnia for the past few nights. It inevitably strikes around 2:00 a.m., when suddenly, I'm wide awake and, contrary to the sage advice of sleep specialists, I lie there in vain for hours trying desperately to go back to sleep. On the rare occasion, I actually get out of bed and read a little, answer some e-mail or do some work, but mostly I just stare at the dark ceiling, thinking about any number of things – what I should make for dinner, the fact that we’re out of cream (horrors), a particularly vexing working project, the note Audrey’s teacher sent home because she was trying to kiss her classmates… You get the idea. 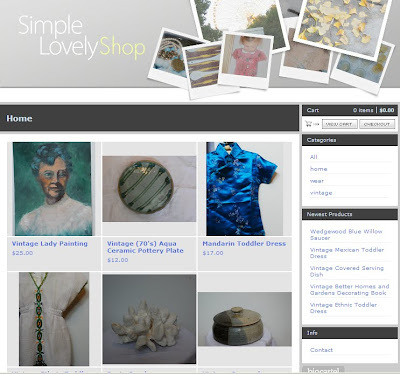 So, without further ado, announcing Simple Lovely Shop. The idea to open a little online shop first came during the closet purge, when all of the sudden I had unearthed not only a pile of clothes (which I’m still planning to sell on ebay) but a slew of special things I’ve loved (and still love quite frankly) that never seemed to find a permanent spot in our house. Grouped together, they all felt very (for lack of a better adjective) “simple lovely”… They seemed to reflect the aesthetic of the blog and, it felt like a perfect starting point for a new little venture. Moving forward, I’m planning to update the shop weekly with things that sort of “represent” the blog -- some vintage, some new…The inventory will always be small – about 10-20 things at any given time, and while I’m not sure how the shop will evolve long term, I do know I want to eventually add some homemade items – Audrey and I have big plans to sell our necklaces in the shop for the holidays. So take a peek and let me know what you think…Maybe you’ll find something you love. Congrats to you....it looks so lovely.....and your dream shop sounds amazing! bravo! sounds like a perfect new venture for you. Well I certainly did find something I love - those two dresses! I would have bought that 3rd one too but it was already sold out :(. Please let us know when you update it. Congratualations! Very lovely concept Joslyn. Now get some sleep. Congrats on opening a shop! - So exciting! Congratulations on your new venture, Joslyn! And I love the dream for the shop... In a way, it already feels like that - the warmth and neighborliness of it is being conveyed through this post. Loved stopping by your shop and having a virtual cup of coffee surrounded by beautiful things. Thank you. I love the shop. Great job! p.s. such great ideas for a fantasy shop too! I absolutely cannot wait until you and Audrey sell your necklaces. Would you consider starting an email list so we know when they're available? I'd love one similar to the one you wear. It would be perfect for a gift this year! I just bought that groovy coral chunk... Love it! Congrats on the new venture. You have impeccable taste. Wonderful idea, Joslyn! I look forward to many shopping journeys in your new boutique! I can't wait to hear more! At least your insomnia is productive!! How exciting! Your fantasy is mine as well. Loved the mental images you created. Off to check out your new digs. Wishing you great success! I wish I could have snagged some of those toddler clothes this morning. Bravo! I'll pretend I am sipping a perfectly pulled blue bottle espresso while purusing the shop. Bravo again! How wonderful - well done!! It really is lovely, my dear! Congratulations. Love that San Jose key ring, but struggling because I know it would end up living in one of my stuff bowls. Perfect venture for you. Just perfect! Congrats. How cool - I want to see what you sold though! I have been thinking of switching my store from Etsy to Big Cartel - curious to see how you like it. I love the Fine Little Shop too. Happy Weekend! oooh thanks for all your kind words and support...you guys are the best! Sarah -- I'll definitely start an email list and send out a little update when we put the necklaces in the shop. Right now we're shooting for November 1st! Good luck with your new shop - such a great idea. What a lovely idea...some beautiful items in your shop already ad I'm sure it will evolve into something big! congrats! some gorgeous things in there and i'm so picturing your dream shop - beautiful! love, love, LOVE it! Congrats and I think the necklaces are a GREAT idea! Can't wait! Oh Joslyn....you have such a lovely way of introducing things and your beautiful shop is no different! How I wish I could go to your fantasy shop as well(that is exactly the kind of place I wanted to open too....) and, I am so happy your online one is there for us to enjoy.